Please write and leave a review on the following sites and see what your neighbors are saying about our services below. It’s as simple as clicking on the icon above for your favorite review spot. It will take you to that page and there will be a place to write a review. For Google you will need to login to your gmail account or create one and in the top right corner there will be a blue box that says “Write a Review”. Click on it and tell us what you think. For Facebook you will simply need to login to your facebook page and go to our page. On the left side bar under our picture you will see a spot for “Reviews”. It will say “Tell People What You Think”. THANKS in advance. We appreciate your sharing your experience with others. While you are there, make sure and check out our latest reviews and be reminded why you chose Dr. 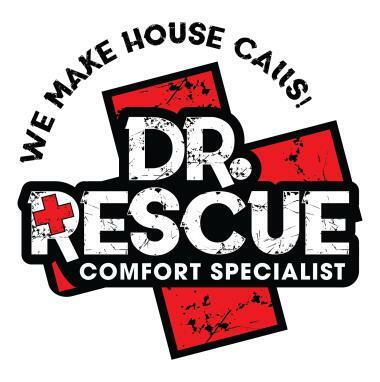 Rescue Comfort Specialist for your Air Conditioning and Heating needs. Yes the Gentleman, did a great job getting my AC to work. I was very well pleased! We’ve used Dr. Rescue several times in the past and will continue to do so in the future. Thank you for the 5 star review and continued trust in our company! As always, Kelly was punctual, professional & knew his stuff. I have been using him for about 5yrs now & he’s always been great! Thank you for the 5 star review and continued trust in our company over the years! He arrived early, and fixed the problem in no time at all! The techs were thorough, professional and very careful to answer all our questions. We remove all register grilles and return air grilles and clean runs to remove all dirt amd debris build up from ducting within home. Performed Ac Tune up on 2 System. Performed Energy efficiency report checklist on Ac tune up. Found no issues at this time. Diagnosed that the vents were closed on upstairs ac. Zone control unit has no faults. Reprogrammed the tstat to allow home owners ability to drop temp below 70. Performed Diagnosis on one system. The downstairs thermostat is malfunctioning recommended replacing. Homeowner is calling his home automation system company to have thermostat replace under warranty. Performed 2 System Ac check only. Found upstairs carrier condenser had a weak capacitor. Installed under manufactures warranty. Checked cooling operations on both systems. Both systems are working to manufactures specs. Performed seasonal tune up on Lennox 3.5 Ton system. Inspected ducts for air leaks. Tested operation of all electrical components for proper voltage and amp draw under load. Installed slim out tablets into drain line. Flushed condenser of dirt and debris. Checked Freon run pressures. Found that condenser coils fouled however charge is correct. Start kit and capacitors are good. Unit is working per manf specifications as of todayâ€™s inspection. Diagnosed to be a faulty control board on Ruud furnace. 24v short was not allowing outside condenser to turn on during cool mode. Replaced board and restored service to the upstairs system. Unit is aged and showing signs of deterioration. Condenser coil is restricted and needs to be serviced. Recommend having a tune up performed. Only replaced board but did not service any other equipment. Performed Ac Tune up on one system. Performed drain clear and condenser cleaning. Checked cooling operations after maintenance. System is performing to manufactures specs. Performed seasonal maintenance on Carrier R410A system. Inspected ducts and return for air leaks. Installed slim out tablets in drain line. Tested operation of all electrical components for proper voltage and amp draw under load. Checked puron run pressures. Flushed condenser of dirt and debris. Unit is performing well upon todayâ€™s inspection. Found noisy condenser fan motor. Installed new motor and checked operations everything is working properly at this time. Diagnosed to be a faulty 80/5mfd run capacitor. Replaced capacitor and checked Freon pressures. Found system to be working correctly upon repairs made today. Diagnosed maim drain line was clogged causing water to back up into evap coil and overflow the primary pan. I cut and cleared drain line. Installed a service T with stand pipe. Also installed an inline float switch on secondary drain port. Installed slim out tablets into line set. Checked Freon run pressures. Unit has a dirty condenser coil and has been converted to 407C when 2015 Trane evap coil was installed. Dr Rescue is not responsible for any water damage and damage caused by water upon repairs made today. Installed new Goodman 3 Ton R410A condenser. Rewired electrical components. Welded copper line sets. Insulated suction line. Installed R410A piston in evap coil. Adjusted puron run pressures per manf specifications. Performed Ac tune up on one system. Found blower motor out on arrival. Got approval from homeowner to replace blower motor. Installed new blower motor and checked cooling operations. Everything is working properly at this time And also to manufacture specs. Checked duct work for mold and proper insulation. Recommend at this time to replace original Duct work inside home. And installing antimicrobial protected flex duct R8. Performed second opinion on downstairs Ac system. Found system low on 410A and dirty condenser coil. Performed Freon leak search on system. Found leak inside evaporator coil. Will send recommendations on repairs on quote. Note - Turned off power to condenser to prevent system from freezing. Performed diagnosis on one system not cooling. Found system low on Freon. Performed leak search on system found a defective valve core. Pump down system installed new valve core and new line drier. Pulled vacuum on system to 500 microns. Recharge system and checked cooling operations. Everything is working properly at this time and too manufactures specs. Recaptured R22 Freon. Removed faulty Carrier 3 Ton condenser. Flushed line set with R11. Set new Goodman 3 Ton Condenser. Rewired electrical components. Welded copper line sets. Installed 410A piston. Vacuumed to -500 microns. Adjusted run respires per manf specifications. Performed temp drop on Registers and found temp was circulating at 62-64 degrees. Compressor speed was at 52%. Unit is not running at 100% speed as demand isnâ€™t there to increase speeds. No issues found with new install. Performed seasonal tune up on Trane system. Tested operation of all electrical components for proper voltage and amp draw under load. Installed slim out tablets in drain line. Inspected ducts and return for air leaks. Checked puron run pressures. Flushed condenser of dirt and debris. System is working per manf specifications. Performed seasonal tune up on Carrier 3 Ton system. Inspected ducts and return for air leaks. Tested operation of all electrical components for proper voltage and amp draw under load. Installed slim out tablets into drain line. Installed new media filter. Checked puron run pressures. Flushed condenser of dirt and debris. Unit is working per manf specifications upon todayâ€™s inspection. Performed check on one system. Found thermostat wire disconnect off condenser unit. Rewired power wire to condenser. Check Freon pressures found system completely out of Freon. Recommended options to homeowner. Performed check on both system. Check game room Ac and duct work. Ac was performing to manufactures specs. Supply temp 51.5 return temp 71 thatâ€™s a 19.5 split across coil. To the manufactures itâ€™s 18-20 split. The duct work is not covered under warranty and drain pan is not either. Performed Ac Tune up on one system. Found system extremely low on 410A puron. Performed leak search on system. Found leak on slab evaporator coil in front middle location inside coil. Recommend replacing under warranty. Did not perform any repairs at this time due to warranty. Diagnosed to be a faulty 50/7.5mfd capacitor. Replaced cap and checked Freon pressures. Found Lennox unit to be working per manf specs. System is in good condition and wel, maintained. Performed warranty company tune up on 2 systems. Found downstairs slightly low on 410A topped off system and also got approval from homeowner and warranty company to open repair work order. Diagnosed wed upstairs AC system is leaking R22 Freon. Leak search was performed and leak was found in American Standard condenser. I injected leak stop and 3lbs of R22 Freon. I recommend full replacement as unit is 15yrs old and furnace is a Consolidated brand unit still utilizing R22.